RayVio, a UV LED solution provider for health and hygiene applications, announced its new 308 nm XR UVB LEDs to support the development of phototherapy treatments for skin diseases. According to RayVio, the new XR UV LED is the key to improved treatment options for Psoriasis and Vitiligo with small and low cost treatment devices. The product is available directly from Digi-Key as an emitter or pre-mounted on a star board for easy development and product integration. 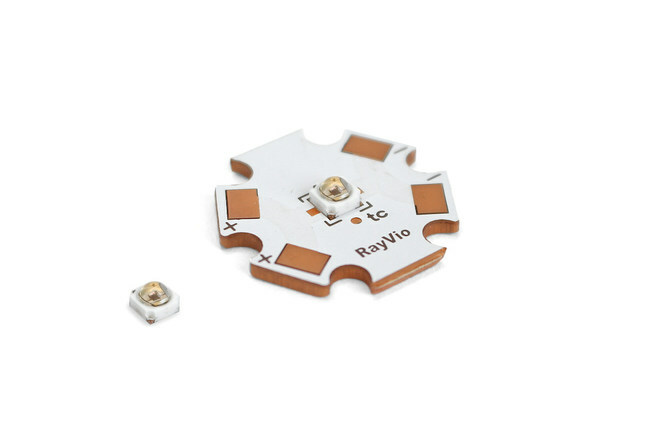 RayVio's new LEDs deliver 13 mW at 100 mA and are rated for up to 10,000 hours of continuous use. "UV Treatment of Psoriasis and Vitiligo have been limited because of the size and cost of the equipment as well as the risk to healthy surrounding tissue," said Yitao Liao, Chief Innovation Officer and co-founder at RayVio. "Excimer laser systems address the targeting of treatment to avoid damaging healthy skin, but the systems are bulky and very expensive. Our 308 nm UV LEDs are being put into compact, handheld devices that are portable." In addition to the UVB LED technology applied in phototherapy, RayVio also offers UVC LED technology for disinfection and sterilization applications like water purification.